On April 3, POET founder Jeff Broin handed over the job of CEO to company President Jeff Lautt. For Lautt, the change is the culmination of his steady rise through the management ranks at POET since joining the company in 2005. And while Broin is still part of the broader checks and balances at POET as Executive Chairman of the Board, for him it represents an opportunity to focus more on industry work through his role in Growth Energy and on charitable endeavors through his foundations. The two executives sat down with Vital to discuss leadership, the evolution of POET and the recent change. Vital: When you first brought Jeff Lautt on board here at POET, did you envision a transition like this happening? Jeff Broin: To be honest with you, I wasn’t thinking quite that far ahead. Without question, the company was continually evolving and growing, and I think we were always looking to add the highest caliber people that we could find in any position. I think Jeff’s background lent itself to the position, which was at that time Chief Operating Officer of Plant Management. Certainly I knew Jeff had a strong leadership background, which I thought was fantastic. I had high hopes that our relationship could develop further in the future. Vital: Jeff, what were your expectations when you started here? We were growing very rapidly at the time. It was so fast and furious. It was just “hunker down and hang on and grow with the company.” It was a lot of fun to see the company change those first few years. Vital: Talk a little bit about how the company changed those first few years. Where we were in 2005? How has POET developed over that time? JL: When I came into the company we were a smaller, family-owned company that was evolving very quickly, evolving into a significant organization. There were a lot of new leadership team members that were coming on board at that time, and we were starting to become more sophisticated in processes and procedures. When I started, I think we were about 500 million gallons capacity. I think we had 500 or 600 people. We tripled in about my first four years that I was here. Typically what I’ve seen is that companies don’t manage growth very well. They’ll grow and they’ll have more revenue, but if you actually look at their performance statistically, it’s usually not as good. Our statistics improved. We became better at what we were doing from top to bottom which is, I think, remarkable of the entire team here at POET. JB: I went out and looked for executives for this company during that time. I looked for people who could each run their own business, people who could run an entire company. Without question we were getting large enough that each division of this company was as big as most stand-alone companies. In the case of Jeff’s position, I had high hopes that he could continue to move up in the organization and of course, as you’ve seen, I’ve been pleased that he was ready for this move. At POET we don’t take promotion lightly. It is critically important that the right people are in the right spot at POET. And in looking to fill the CEO position there was no question that Jeff Lautt was very well qualified for this role. Vital: Tell me about leadership qualities and what is needed to be the CEO. JB: Well, in my opinion to be a CEO you need to be a Jack-of-all-trades. You need to be able to wear the hats of almost everyone in the company at any given time. In this case, you need to understand finance, management, engineering, research, marketing, risk-management and more. It is very rare to find someone who could step down into each one of those businesses and understand them, even run them if they had to. That’s what I was looking for in a CEO, and in Jeff’s many years with the company it became obvious to me that he had the capability to step down into any one of those areas and not only understand them but operate them if necessary. JL: Jeff said it very well. We operate a number of business units, and they are all very complex and unique in their own way. Earlier in communications, for instance, we didn’t do a lot from the standpoint of helping to shape public perception of the industry. Then we brought ourselves above the radar. Whether it was our website to things in the local community, to national advertising on CNBC and MSNBC I mean, we hadn’t done any of that or even talked about doing any of that. Jeff started doing a lot in DC, and we became the go-to company for companies like Reuters, Wall Street Journal, The New York Times … When there was a news piece about ethanol, this was the company they called. I ran into somebody this weekend, and we were talking about POET. They had a question about when we went from Broin to POET. It reminded me of our big roll-out when we brought in Neil Armstrong. This was a younger person, so I said, “Now you know who Neil Armstrong is, right?” They smiled and said, “Yeah, I think so.” I said, “The first person on the moon?” And they said, “Yeah.” It was a pretty awesome event actually. I don’t know how you could not get goose bumps when we did that. Vital: How do you two think you’re different? JB: Without question Jeff is more technical than I am because of his engineering background. I can delve into the technical if I have to, but he really understands it, you know what I mean? I think — we’ll see if he agrees with this — I think that I’ve probably got a little more marketing at my core. Other than that we are exceptionally similar. We think a lot alike. Don’t you agree? JL: Yeah, I do. The way I describe it to people is I think our ideologies are very, very similar, our conservative views on things, how to treat people, how to make business decisions, all of that. Jeff is very influential; he’s very good at it as you probably all have witnessed. He markets the company and the things it is doing everywhere he goes – Washington to right here in our own plants and businesses. He is tireless in doing that. One thing I don’t have and I can never replace is Jeff’s experience in growing up in the business, including the plant. There’s nothing better than hands-on and actually living it, especially those early years. So in the years ahead I’ll continue to lean on Jeff and his experience. While he may say he doesn’t have a technical background, he can hang with the tech folks pretty well. Vital: We’ve talked a lot about the knowledge part of the CEO position, but so much of the CEO position is also strategy and style and leadership. How would you say your style is different? JB: I think our styles are fairly similar. We have a very similar value system, so I don’t see a lot of difference in style. I think we both are very driven. We hold people accountable. We both have good vision for the business and where to take it next. I think also we both are really good listeners. Any successful company manager needs to dedicate a percentage of their time to listening to the people around them. JL: Well, I’m kind of racking my brain in terms of major styles, big differences. Jeff is maybe willing to take more risk than I am. I tend to be a little more cautious. I probably like to see things more proven out first. Maybe that’s the technical side of me coming out. I’ve taken risks, and I’ve supported investments that have definitely had some risk. But I think if you were to do the side-by-side comparison, I would give Jeff the upper hand in willingness to take risk. Maybe that’s given the fact that you’re also the owner of the company and I may be a little more sensitive to making sure we’re making the best investments available as an organization. JB: I think that without question what got us where we are today is calculated risk. On occasion it doesn’t turn out well. Life isn’t risk-free, but you want to take conservative and calculated risk. I think Jeff does take good, calculated risk, and you know as a company we will continue to work together to make the big risk decisions. I think our combined experiences and our combined strengths will make us even better decision makers. JL: The reality is you don’t build a company without making some mistakes along the way. You’ll have failures. That’s probably something that’s helped me as a leader. It’s OK to know I’m going to make a bad decision once in a while, and ultimately the buck stops somewhere. You just have to get some big shoulders, recognize it, take accountability, understand what you did wrong and work hard not to repeat it. JB: Life is a learning experience. The goal is to survive the learning curve. It really is. Vital: Can you talk a little bit about how things work at POET with the change at CEO? JB: You know in my new role I really appreciate the additional flexibility. I get to spend more time with my family. I’m going on a mission trip to Africa in June. That would not have been taking place if I was CEO of the company. I have some smaller things I’m working on and a foundation that I’m starting and working on. I am in the office several days a week. Jeff and I meet once a week for an hour to an hour and a half, just to review everything that’s going on in the business. He brings me up to speed on the larger items. If there are any smaller issues he wants my input on, he brings them up and we talk about them. In addition I’m still very involved with Growth Energy, still dealing with a lot of public policy relationships. Hopefully I can lend some of my time and experience to continuing to work the public policy front and anywhere else I can help the company. I also have experience just operating the plant processes and helping to develop them over the years. Jeff will be bringing a lot of decisions to the Board of Directors, and we will be deciding on them. JL: Not only as far as investments but with strategic direction as well. Vital: Talk about the ethanol industry, where it’s going, how POET’s role may evolve. JL: I think if you look at the cycle this industry has gone under it’s almost classic of a lot of industries. It started with a lot of pioneers, a lot of entrepreneurs who believed they could create an industry. The early years were very, very tough. They had some support along the way from the government to help them get there, but they fought hard, got some traction and then you saw enough sound business and technology to actually create a return. So those returns started to attract capital, and it started to perpetuate. You saw a lot of attraction of more capital, and that added equity to the industry. The industry eventually attracted too much capital and overgrew and went through a rationalization period where there’s typically a shake out. Sometimes those investments go away completely or they end up in the hands of other owners who know best how to manage it. Now I think we’re going through a stabilizing phase. I think there could still be some rationalization in the next three to five years, and I think you’ll see us return to growth again as an industry. The growth in the future probably won’t be like it was in the last 10 to 20 years; it will be more diversified. I think while there will be some corn ethanol growth, there will be some new emerging sectors like cellulosic. We will continue to apply more and more technology to making new products from corn using the assets that we’ve invested in over the last 10 to 20 years. The barriers to get into the business will be different than they were 5, 10, 15 years ago. You’re going to have to have technology, you’re going to have to have capital and expertise, which gets me personally excited about where we’re at as a company, because I think we’re well positioned. There is no company in this industry like POET that has all aspects of this business and has the expert teams that one needs to capitalize on the opportunities that will be there in the future. It will be more challenging, but I also think it can be more rewarding as well. Vital: Why did you decide to make this change to executive chairman and set aside CEO? JB: I’ve been in this position a long time, for 25 years. I’ve taken this company from a very small company to a very large company. Along the way sometimes I didn’t get to spend as much time with my family as I wanted to. Sometimes I didn’t have time to be involved in things that interested me. So after 25 years I decided it was time to step back, take a lesser role. I think I still have a lot to offer, so I will still be involved, but I wanted to step back to give myself some more flexibility. Prior to making this decision I took a sabbatical and went to an executive retreat. I was able to step back and really assess my priorities. While I very much enjoy the challenge of this business and the world-changing aspects of this business, my faith and my family were higher on that list. This transition allows me to reorganize my life so that I can get back in line with the priorities that really are important to me and still contribute to the challenge of this business and changing the world to make it a better place for my children and grandchildren. JL: Ok taking this a little further. Are there other people, other CEOs or leaders that you have watched through the years that gave you an example of how to do it or how not to do it? JB: Yeah. Steve Jobs. No question when Steve Jobs died I remember watching that on the news, thinking that Steve Jobs pushed himself extremely hard. It’s part of what I believe eventually took his health. That’s a path that I really wasn’t interested in going down. Vital: This company has been your baby. I mean you were 22 years old when you started with 13 employees when you first got it going you were producing a million gallons a year to what the company is today, and it’s all happened under your leadership and direction. This had to be an incredibly difficult decision. JB: It was so difficult I had to take 30 days off to decide. I had to step away from the company for a short time to reassess and take a look at my different priorities and really decide to change the way things were in my life. And I stand behind the decision 100%, for the company and for my personal situation. Vital: So two months into it, have there been any times where you’ve had to step back and say, ok this isn’t my decision anymore? JB: I’ve had to step up into a new role just about every year for 25 years. I left behind duties over and over again, as many managers do. Is it ever easy? Not necessarily. I think it’s always somewhat difficult to step into that next role, but I think I’ve done that so many times for so long that it wasn’t as difficult a transition as it would be for many. Have there been a few times where I felt a little bit that way? Sure, as would happen to any manager that steps into a new role. But it’s been very minimal, and again I think that the similarities in Jeff’s and my style and our ability to just talk things over have made this a very smooth transition. Vital: How about for you, Jeff Lautt? When this idea first came up for you to take on the CEO position, what was going through your head, and did you have any hesitation? JL: Well it was definitely a serious decision. Probably not to the magnitude that Jeff had to make, but it was a serious one. I think what made it maybe a little bit easier was that if you were from the outside coming into that position, that could be very daunting. 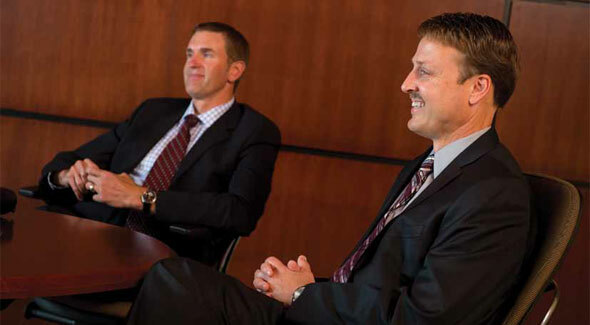 But having worked alongside him for over 7 years, having built a relationship, both personal and professional with Jeff Broin, I think that made it easier. I think if anything through the discussions of the change I probably pushed Jeff to make sure it was really what he wanted to do. In some respects there’s no turning back, and I wanted to make sure that he really was ready. It’s rare to see a 25-year CEO anymore in the world, and it happens to be the founder of the company and the company’s only CEO in its history. Those are some pretty big things to take into consideration. So I was obviously completely honored that he would have the confidence in me to do so. A lot of thoughts go through your head: A) You don’t want to screw it up; B) I think it’s natural to say, “Am I ready? Can I really do this?” We talked about how our two roles would work together and mesh. I think it’s gone really smoothly because we have a strong previous relationship, and I had already been given a lot of responsibility over the years. Vital: You asked yourself the question, “Am I ready?” You guys talked a little about each other, but why did it feel like you were ready and able to step into this new role? JL: Well, you know when I came to this company I had to learn to become a good Number Two, and in that process I became comfortable. There are those decisions that come to Jeff’s desk in terms of being the face of the company and some of the politics and things that you can’t put on a job description that come with being in the role. I wanted to make sure I was ready to step up, because I take great responsibility in what he was asking me to do, to take and lead this company forward. I believe it has to go that direction; it has to go forward and not just take it the way it is and run it and maintain it. I mean that I wouldn’t be doing any justice to what he’s created here as an organization. Vital: So now in this role as CEO of POET, a couple of questions. What do you see as one of the biggest challenges POET is facing and then on the flip-side what are the biggest opportunities that you see? JL: Well it’s hard to ignore the market issue, which is a big challenge we have. It’s one that the industry has but it has to be one of the biggest challenge we have at POET as well. It’s a double-edged sword in that we have become 10% of the nation’s fuel supply. That’s the success. The negative is there are hurdles to accessing the market further and the solution is to try to solve this problem. We have a great product — a great set of products — to continue to advance the country forward on energy independence. It’s a cleaner fuel that is healthy, it grows economies and agriculture. But we need access to the market, and that is our biggest challenge. It’s a David vs. Goliath battle, and I think it always will be, but that’s OK because I think we are that feisty little company that has grown, and we have some power. We have a lot of good things on our side. We have a lot of good products. Most importantly, we have great people. As for opportunities, there are so many additional ways we can create new value. It could be feed, new food products, it can be industrial products like oil, zein, biochemicals. I believe when we look back 20 years from now we’ll see a development of a whole new portfolio of products created from our technologies. JL: Well I think there are opportunities for people. I think as the company continues to spread its wings, continues to grow, there are going to be opportunities for people within the company to grow with it. There are going to be opportunities for new people to join the company to help us to continue to do good things, quite frankly to make the world a better place. Vital: Do you anticipate there will be noticeable changes inside the company? Lautt: Maybe some little things here and there. I think because Jeff and I have similar values and ideas, there are not going to be any major shifts. If there is a major change or shift in the organization I’d say that change would have happened whether Jeff was the CEO or I whether I was the CEO. We are two different people. He’s a unique individual and I’m a unique individual. He has some ideas, and I have some ideas. What I feel comfortable with is that he’s given me complete authority as CEO and to not feel like I’m held back. If there are directions that I think we should go, strategic decisions, we’ll discuss them and make sure that they’re the right path for the organization. Every time we’ve made significant decisions as an organization it’s been a team decision. Whether it’s the leadership team or the Board of Directors, we’ve always talked about major investments and strategic directions. It will continue to be those same teams working with me in those discussions and deciding the direction of this company.